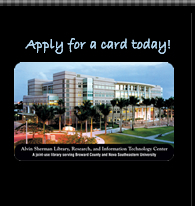 On December 8, 2001, the Alvin Sherman Library officially opened its doors to the NSU community and the public. Today, it is a cultural and learning center serving more than 480,000 visitors each year. On average, our reference librarians answer 32,100 questions a year and we circulate almost 300,000 items including everything from video games to best sellers. Large and small groups use our meeting rooms. Every day the spacious atrium welcomes young and old. Happy 10th Birthday to this vibrant community resource! 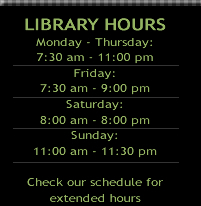 Happy 10th Birthday, Alvin Sherman Library! Come to our party and celebrate with birthday cake, a special performance by our very own Shermanettes, fun activities, and a show by nationally known Fred Garbo Inflatable Theater Company! 2-3 pm: Fred Garbo Inflatable Theater Company at the Rose and Alfred Miniaci Performing Arts Center **Show is free, but tickets are required**	Free tickets for Alvin Sherman Library card holders will be distributed beginning Saturday, Nov. 26th, through 6pm Thursday, Dec. 8th , while supplies last. Call for information: 954.262.5477. Make sparkly greeting cards, gift tags, and more! Nora Quinlan, Director of Reference at the Alvin Sherman Library, presents how to store and protect photographs, historical documents and family keepsakes for future generations. The Genealogical Society of Broward County's monthly meeting is held at the Alvin Sherman Library. The program begins at 2:30 pm after the GSBC open lab (12, noon - 2 p.m.) and the Genealogical Society of Broward County business meeting (which begins at 2 pm).Sponsored by the Genealogical Society of Broward County. 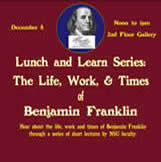 Sunday, December 11 2 - 4 pm, 2nd floor, Gallery. Russian pianist Damira Feldman returns to Sunday Happenings to delight us with her vibrant, elegant and vivacious style. Her program features works by Cui, Arensky, Rubinstein, Tchaikovsky, Scriabin and Rachmaninov. Saturday, December 17 1 to 3 pm, 1st floor, Rm. 1017. Join Tennille Shuster, award winning graphic designer, illustrator, and book artist as she guides you in basic paper engineering skills, culminating in the creation of folded pop-up greeting cards. All materials provided. 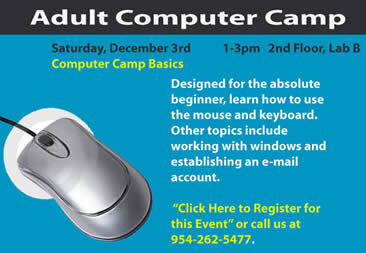 “Click Here to Register for this Event” or call us at 954-262-5477.